In cooperation with the biggest operators and video services providers, we have created a unique system that allows our customers to access their VOD and TV services in their cars. Since electromobility times and autonomous systems are coming, there comes a time when passengers want to enjoy their journey with some entertainment. All in these simple steps: Sign up – connect your account to your car- watch content in your car. We have developed solutions which we are gradually integrating into individual car brands. Car manufacturers prefer our service as it complexly provides dozens of TV and VOD services in one application and it offers thousands of TV channels, films and series of all genres including premium content. We will soon introduce the first car brand, which will provide an endless amount of video content to their customers. 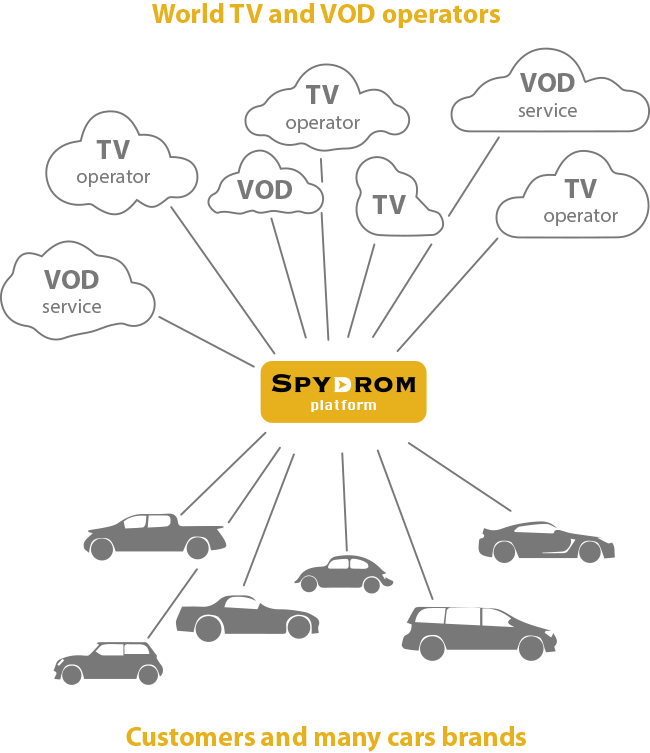 Spydrom is currently finalizing integration of services within the EU, so that at least one major TV and VOD operator is integrated in each country. The service provides online TV and VOD streaming. We are preparing the sharing on other displays in your car and on your own device.